Goodreads and I became good friends in the spring of 2009. Before that, we were casual acquaintances; I would check in every now and again and add a book about that often. But in 2009, I suddenly caught the vision and realized that Goodreads was not only a great way to keep track of what I had read but also what I wanted to read. I started shelving books that friends told me about or that I heard about through a blog or website. Suddenly, I no longer had to rack my brain, “Now didn’t Sarah just mention a good book? What was the title again? Something about a princess? Or was it a pioneer?” I no longer said things like, “Oh, I like to read. I just never know what to read.” Now I always have dozens of options to choose from, and I can pick something that fits my current mood. 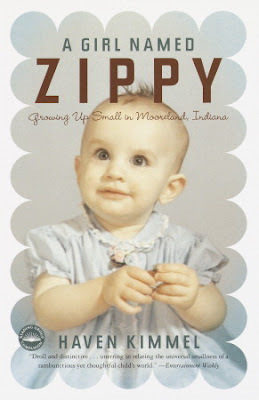 Once I decided that Goodreads would save (and also help me waste) a ton of time and frustration, one of the first books I added to my to-read list was A Girl Named Zippy (on April 5, 2009, to be exact). I can no longer remember what prompted me to save it (I definitely could be better about noting where recommendations come from), but there it has sat for years while other books last only a couple of weeks or never make it on my to-read list at all before I start reading them. It hardly seemed fair, so when this book was selected for my book club in August, it offered the perfect excuse to grant it a coveted spot among the “currently reading” books. And that long, pretty-much-pointless introduction probably knocked off all but my die-hard readers. Sorry about that. Haven Kimmel grew up in a small town (pop. 300) in Indiana. She was nicknamed Zippy after her dad saw a “zippy” monkey on television. The book is a collection of memories and stories, mishaps and adventures from her childhood. When people say that their lives aren’t interesting enough to write about, I can no longer believe them. Their lives are probably plenty interesting; it’s just the way they present it that could use some work. As humans, I think we all have this innate desire to eavesdrop and spy on the lives of other people. If this were not the case, facebook would never have taken off and gossiping wouldn’t be such a difficult habit to break. In the case of A Girl Named Zippy, I loved it because of the parts I could relate to (growing up in a small town) and also because of the parts I couldn’t relate to (the 70’s, her home life, etc.). I somewhat suspect that many of her stories were heavily embellished: there were so many details and so much dialogue that unless she was keeping a daily journal from the time she turned two, a completely accurate portrayal of such an early time in her life would probably have been impossible. Now did they really test the lights every time they made a stop? Maybe. Maybe not. But do you think that’s how little Zippy felt when all she wanted to do was get to their destination while her father seemed totally bent on not getting there? Most definitely. That’s what made this writing so entertaining but also so accessible. But speaking of perceptions and the strength of memories, this book made me wonder what my boys will remember from their childhoods in 30 years? Specifically, what will they remember about me? Zippy talks about her mother in an affectionate but also condescending way. In almost every story, her mother is reading on the couch while the house falls to ruin and she is unaware of her children’s whereabouts. Whether this is entirely true or not, this is what got logged away in Zippy’s memory. And my boys are forming their own memories every day (which I can only hope will someday not be published in a memoir!). I’ve been trying to figure out why I loved Haven Kimmel’s writing so much, and I think it boils down to this: it was simple without being unimaginative and clever without being glaring. She captured the small-town, little-girl language and made it sound like an intelligent adult was writing it. I loved how she could end a chapter with a sentence as simple as “It would be another warm night,” but because of what came before, that one sentence suddenly sounded nostalgic and profound. I also loved all of the truly insightful metaphors she used, such as this one: “Dana turned to see the shot fall, then looked back at me. She issued a sound I’d heard dogs make at each other when they really wanted to fight but also had to finish their dinner.” Her metaphors always seemed to be appropriate to the setting while adding to my overall impression and picture of her childhood. This book ends when Zippy is still in grade school. The last story is great (Christmas, Santa, dreams coming true and all that), but it felt very unfinished. What happens when Zippy reaches high school and begins to mature and grow up? Luckily, I found out there’s a sequel: She Got Up Off the Couch. You can bet I’m going to be reading it (I already put it on my to-read list!). My one regret about this book is that I didn’t get to go to book club and discuss it with everyone. So sad! If anyone wants to have a mini-book discussion, feel free to start one in the comments! I really enjoyed this one and it has a special place in my heart because it's set in Indiana!